The US dollar initially rallied in early Asia ahead of the US-North Korea summit but has subsequently shed the gains and more. As North American dealers return to their desks, the dollar is lower against nearly all the major currencies, but the yen and Canadian dollar. The greenback is softer against most of the emerging market currencies as well, though a few eastern and central European currencies are bucking the move. 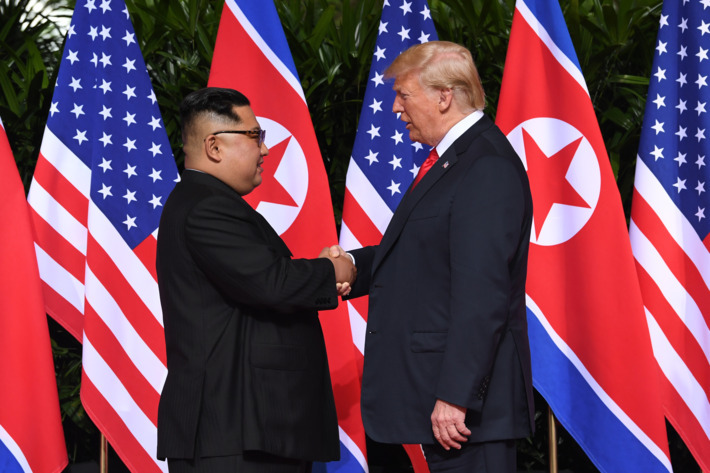 Investors appear largely unimpressed with the summit. The MSCI Asia Pacific Index edged higher (less than 0.1%), Japanese and Chinese markets rose (0.3% and around 1% respectively), but Korea shares slipped, and foreign investors were net sellers of Korean stocks for the second consecutive session. The Korean won is off about 0.2%, making it one of the weaker emerging market currencies after the Turkish lira (~-0.6%) and the South African rand (~-0.4%). The US indicated it will maintain its troop presence in South Korea and that sanctions will remain. That will be a challenge. China quickly indicated that the UN should look to lighten or lift the sanctions against North Korea. Trump recognized that China has relaxed its border control lately (he added that it was "ok"). With the G7 political theater behind us and the historic US-North Korean summit also over, attention returns to the macro. The UK jobs data was mostly in line with expectations. The May claimant count slipped by nearly 8k. It is the second decline of the year. Average weekly earnings, excluding bonus payments, slipped to 2.8% from 2.9%. Including bone bonuses, the pace slowed to 2.5% from 2.6% (in the three months year-over-year through April). The ILO measure of unemployment was unchanged at 4.2%. The risk of an August high by the BOE is essentially unchanged, a little above 50%. The UK reports inflation tomorrow and retail sales on Thursday. However, the focus today and tomorrow is shared with the Brexit debate as the House of Commons debates the Withdrawal Bill and the 15 amendments approved by the House of Lords. Prime Minister May has sought numerous compromises with the Tory rebels who threaten to vote with the opposition to soften the hardline coming out of May's cabinet. At the same time, the rebels understand that May's position is precarious, and may not want to help topple her as the replacement would likely advocate a harder line. After the EU summit in a couple weeks, there will be an opportunity again to fight when the Trade Bill is debated. The challenge still lies ahead. Even if the UK endorses staying in the single market and customs union, EC insists that those privileges come with responsibilities--free movement--and this, along with the Irish border remain intractable challenges. The German Dax has been on rallied strongly here in Q2. In fact, it has fallen in only two weeks this quarter for a 6.25% gain. However, the ZEW investor survey, which often seems to take its cues from the DAX, continues to trend lower. Since January, the assessment of the current conditions has deteriorated consistently, and today's reading for June slumped to 80.6 from 87.4. It is the lowest since March 2017. The expectations component has also softened. In June, it fell to -16.1 from -8.2. It was worse than expected after two months of stability. It also has not risen since January. The ECB meets Thursday. Most of the focus is on potential signals for what happens after September. The consensus is for purchases to be tapered in Q4 (no hard stop), but details may have to wait for next month. The ECB's staff will likely boost inflation forecasts, as the euro is weaker and oil firmer than was the case three months ago. The risk is that growth forecasts are pared. Draghi often cites the survey data, which indicates the softening seen in Q1 has continued into Q2. Meanwhile., redenomination risk in Italy continues to retract. The new government has sounded more investor-friendly than many anticipated. Italian bonds continue to recover. The 10-year yield is off seven basis points to 2.75%. It was as high as 3.13% recently. The two-year yield is off 10 bp to almost 90 bp. It peaked near 2.63%. Itlay raised 6 bln euros in a one-year bill auction today at an average yield of 55 bp. Last month (May 10) Italy last sold the one-year bills. Then the yield was minus 36 bp. At the height of the panic, it looked like Italy might have to pay closer to 2%. Greece will sell one-year bills tomorrow, and the yield will likely be nearly twice as much as Italy's, though there was a time last week when it appeared Italy would pay more than Greece. The US reports May CPI figures today. Inflation is expected to edge higher. The headline is expected to have increased to 2.8% from 2.5%, and the core rate is expected to rise to 2.2% from 2.1%. The market has tomorrow's hike fully discounted and sees almost an 80% chance of a hike in September. US legislative activity may also be salient for investors. Two bills, in particular, caught out attention. The first is actually an amendment to the defense spending authorization bill that seeks to punish the Chinese tech company for its numerous violations of US laws. According to press reports, the easing of the sanctions on ZTE was an important measure to get China to talk about trade. Press reports also have linked the White House decision to favorable business concessions by the PRC (new trademarks for the President's daughter and a $500 mln PRC investment in a Trump property in Asia). The other bill is also enjoyed bipartisan support, and it seeks to re-establish Congressional role in trade. Specifically, it requires Congressional approval for tariffs designated on national security grounds. It applies to all new action (such as autos, where imports are being investigated on national security grounds), and actions over the past two years (e.g., steel and aluminum). There are several options that will likely impact trading activity in the North American morning. Between $1.1775 and $1.1790, there are nearly 1.7 bln euros in options that will be cut today. There are also $1.1 bln in expiring options struck between JPY110 and JPY110.30. There are about GBP570 mln struck between $1.3375 and $1.3400 that expire today.